If, like me, you were a bit gutted to miss out on the Owl Print dress at M&S recently, I've found an alternative for you! Joe Browns recently contacted me to see if I would like to chose something to review and it didn't take me long to spy this gorgeous owl print..
Also took a few pictures without the cardigan to show off the pretty shape of the dress. It's very flattering with a nipped in elastic waist and a bit of frill around the shoulders. As well as wearing it as I have today, it will work well with skinny navy or grey jeans or a camel or teal cardigan and I will layer it over a long sleeved top on colder days. Thank you to Joe Browns for sending such a cute dress and some fab navy leggings that are going to earn their keep this winter too. That is lovely, you are totally inspiring me to wear a shorter dress, I am a bit shy in wearing mid thigh (and all the pretty dresses are mid thigh). Today I am wearing a mid thigh dress with leggins...woo hoo. That's really cute on you Avril, I like the look of those shape dresses but never really know what to do with them. 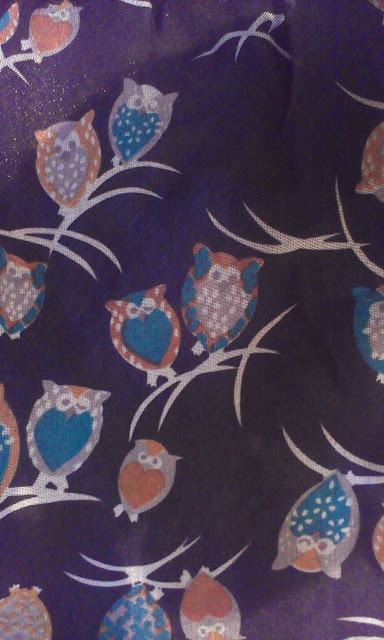 Can't believe I missed out on that M&S Owl Print dress too - it's gorge! I like it because from a distance it doesn't look like owls! Looks like little leaves for autumn! Owls are bittersweet for me this year as my Nan loved them so seeing them everywhere makes me think of her. You're doing great on the frock front. I've not worn one since August when I was on holiday. I'm trying to break new ground (for me) by wearing some grey tights though I have to find some nice ones first. I keep thinking they will make my legs look really chunky whereas black is the failsafe and more flattering but unfortunately, don't always go with everything. And lucky you getting an owl dress sent to you - I remember when you did the post on the M&S one and you said it had sold out really quickly. Just wish I could wear more dresses! I love the dress, what is the sizing like? Fab dress, looks gorgeous on you! I saw this article, loved the dress and decided to treat myself. It came today and is gorgeous. I'm a 12-14 and ordered a 12. I would say their sizing is very accurate. It is very flattering and a lovely material. Thanks for the tip-off. (I now just have to convince my husband I've had it for ages!!!!). My own dress just arrived today - size 12 and probably quite a flexible 12 (ie will be ok if I put on or lose a bit of weight). Quite short and see through though, so I may end up wearing it over skinnies.